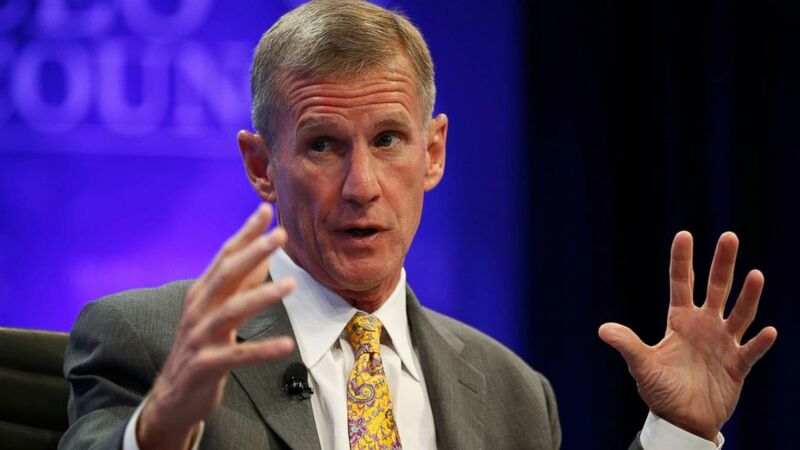 McChrystal spoke to the "Powerhouse Politics" podcast. Retired Army Gen. Stanley McChrystal joined ABC News’ Political Director Rick Klein and Chief White House and Washington Correspondent Jonathan Karl to discuss what makes an upstanding leader in the United States as the nation heads into the next presidential election. 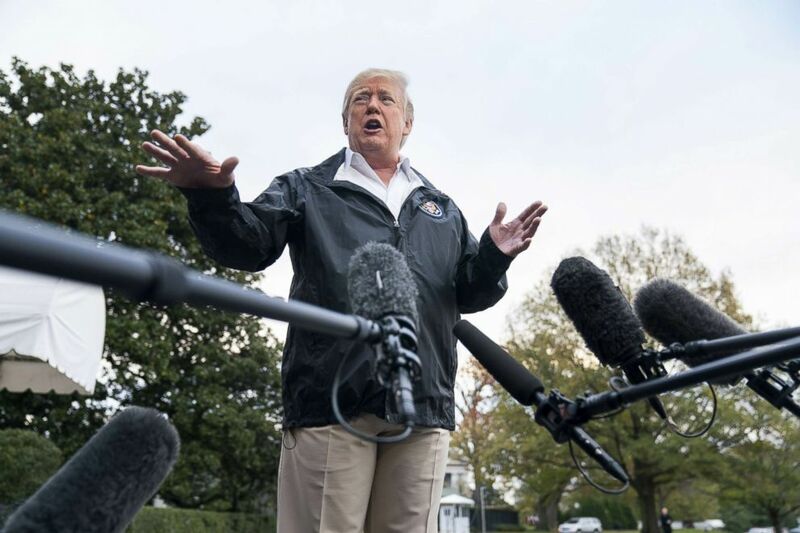 The discussion on the Powerhouse Politics podcast centered on President Donald Trump’s attacks on retired Adm. Bill McRaven, who commanded the commando team that killed Osama bin Laden in 2011. In a recent interview, Trump said it would have been "nice" if the al-Qaeda leader was killed earlier, inferring that the timing was McRaven’s fault. “What are we to make of a leader that speaks the way he does about very highly-regarded military leaders in this country? Adm. McRaven obviously is the most recent example,” Karl asked. (Kevin Lamarque/Reuters, FILE) Retired General Stanley McChrystal speaks during a session called "Lessons in Leadership" at the Wall Street Journal's CEO Council meeting in Washington, Dec. 2, 2014. “His discussions on Bill McRaven, as well as his previous discussions on John McCain and others have been something that’s deeply disturbing to a lot of thoughtful people,” McChrystal said. “The fact that he would take on people in this vitriolic manner, I think is pretty upsetting to people. (Jim Lo Scalzo/Pool via Getty Images) President Donald Trump speaks to the media before departing the White House for California, Nov. 17, 2018 in Washington. Trump recently bragged that no one has been more “with” the military, including vets, than he has, namely in terms of funding. McChrystal said he disagrees. The retired general also criticized the Trump administration’s handling of the situation at the U.S.-Mexico border. His new book, “Leaders: Myth and Reality,” studies thirteen prominent figures throughout history, from Walt Disney to Robert E. Lee, and how their situations and leadership styles drove them to success. McChrystal dedicated his book to Sens. John Lewis and John McCain. Klein asked McChrystal if any parallels could be drawn between those leaders and Trump. 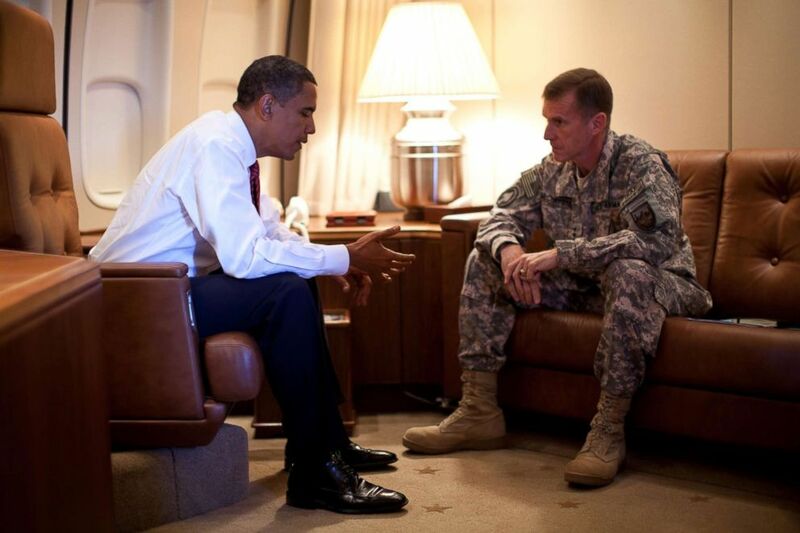 (Pete Souza/The White House) President Barack Obama meets with Army Gen. Stanley McChrystal, the Commander of U.S. Forces in Afghanistan, aboard Air Force One in Copenhagen, Denmark on Oct. 2, 2009. McChrystal warned against putting too much responsibility on Trump’s shoulders. “There is no leadership without followers. We need to look in the mirror and decide ‘OK, what leaders do we want? What leaders are we willing to follow?’ and when we ask ourselves that question, it can bring up some pretty disturbing questions for us,” McChrystal said. The notion that leaders are a reflection of the population is one of the central arguments in McChrystal's book. American attitudes are reflected in whom they elect, displayed in Trump's 2016 election and in the Democrats' success in the House midterm elections. He said the rise of Trump was natural, but warned of the responsibility that comes with drawing so heavily on the unhappiness of Americans. Klein asked if after doing this research he felt more or less optimistic about where things stand today and if an individual leader could change the course of the country. “We looked hard at it, because I think as a crisis of leadership in America, it’s not on one person. It’s not on President Trump or anyone else,” he said. "I think leaders have got to make us better than we would otherwise be. They’re not the people who pulled the petty side out of us, the darker part of us ... they’re the people who help us see where we ought to go."